University of Ontario Institute of Technology's 2018 Major Entrance scholarship recipients. Back row (from left): Robert Bailey, PhD, Provost and Vice-President Academic; Erin Mattes; Aiman Quraishi; Hannah Oegema; Steven Murphy, PhD, President and Vice-Chancellor; Cristianna Giallo. Front row (from left): Tessie Pulla-Chin, Courtney Lockhart, Keegan Post. Each year, seven outstanding incoming students are awarded the university’s most prestigious entrance scholarships. The scholarship program serves to recognize secondary school students with exceptional achievements in academics, leadership and community involvement throughout their high school career. This year’s Chancellor’s Scholarship recipient is Tessie Pulla-Chin (Nursing) of Oshawa. Choosing the university for its small class sizes and various experiential learning opportunities, Tessie is ready to immerse herself in the full university experience. 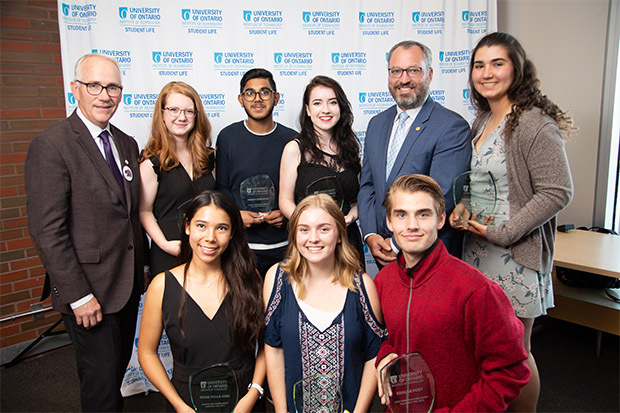 This year’s President’s Scholarship recipients are Erin Mattes (Forensic Psychology) of Whitby and Cristianna Giallo (Biological Science) of Toronto. Both students chose the university for its innovative learning opportunities and inviting atmosphere. This year’s Founder’s Scholarship recipients are Hannah Oegema (Commerce) of Bowmanville and Courtney Lockhart (Health Science) of Victoria Harbour. Hannah selected the university because she believes it will be the perfect environment to challenge her on the road to success. Courtney chose the university because of its hands-on learning opportunities, small class sizes and advanced technology. Rounding out this year’s domestic recipients is our FIRST Robotics Canada Scholarship recipient, Keegan Post (Nuclear Engineering) of Oshawa. Choosing the university for its proximity to home, unique nuclear engineering program, and internship opportunities, Keegan knew this would be the best school to build his career. This year’s international Global Leadership Award recipient is Aiman Quraishi (Electrical Engineering) of Doha, Qatar. Aiman chose the university for its cutting-edge programs, innovation and commitment to equipping students with the skills needed to succeed in an ever-changing workforce. Our university is honoured that the scholarships made available to our students are enabling continued success and guiding them to be exceptional in their future. All of our award recipients work hard and their success is recognized through these prestigious awards. We are happy to introduce the major entrance scholarship recipients for the 2018-2019 academic year. For information on applicant criteria for each award, visit the scholarships web page.